It rained half the night so Beau decided not to run. He stayed home and kept an ear open for Lilly's waking up (granddaughter spent the night) and I headed out to do the 3 yardsales in the neighborhood; he was going to call me when she woke. But, that sweet little girl just slept on and I made 5 before I headed home. Normally I'm looking only for art/craft supplies, but Alex is moving in two weeks and needs a whole lot of stuff ... so I'm adding kitchen items to the list. Today I picked up for him a variety of drinking glasses and some bowls. 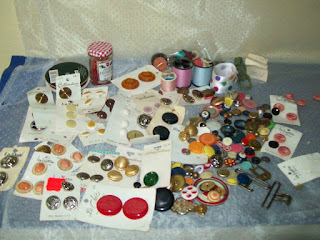 Only one supplies find for the day ... a box of buttons, with a couple rolls of thread for a whole $2.00. Some great buttons in here ... Think I'll take a little time tomorrow (Lilly willing) and put together another bead and buttons charm bracelet ... or two.